The wedding industry in South Africa has grown exponentially- a trend that has been experienced all over the continent. The country is in a great position where not only locals are spending money on their big day, but foreigners are also choosing South Africa as the place for their destination wedding. Looking at the amount of money that is being spent on weddings in the country, this is a perfect industry for entrepreneurs with creative flair. A bridal shop is an integral part of this industry and eager brides are happy to spend money on their dress if they can find a service that suits them. Weddings are a multi-billion-rand industry in South Africa. There is a strong cultural significance to African weddings. Expanding disposable incomes and middle-class in the country has meant more spending on weddings. Bridal shops have played a large role in the wedding industry for many years. These shops are mainly centred on selling the iconic staple of weddings: the wedding dress. In western culture, the dress is traditionally white but there are several variations in South Africa as a lot of brides choose to have dresses that are more reflective of African culture. No matter what kind of wedding dresses your shop stocks, this industry is one that requires that you have a lot of patience with your customers as brides will be looking for a product that many of them have been fine-tuning in their heads since they were little. The demand for wedding goods and, with that, dresses have grown. This means, however, that there is also a lot more competition. If you want to be successful, you have to know what it is that makes your business stand out from other bridal shops. It is important that bridal shop owners have something different to offer. Do you offer a more luxury service? Do you sell plus-size dresses? Could you focus on vintage dresses? There are also a lot of businesses that are opening up that sell wedding dresses online. These businesses are competing with lower prices because they don’t have rents to pay. There are also a lot of people in the industry that operate their businesses from home which can also allow them to sell dresses and other products at a lower price. If you are looking to buy a bridal shop, keep this in mind when you are considering the rent that you have to pay. You may want to include an online component to your business and do research to find out what the competition is near where you are thinking of setting up shop. Most bridal shops offer alterations as a service so that brides can make sure that their dress fits perfectly. Bridal shop owners can hire the services of a seamstress, but a good seamstress might demand a good wage, and this will need to be factored into your costs. It will help to have some idea of what is and isn’t possible to do for alterations if you want to come across as knowledgeable to your clients. Wedding dresses are also influenced by trends and so anyone in this industry will need to be able to keep up to date with what will be popular in the coming seasons if they want to remain relevant. 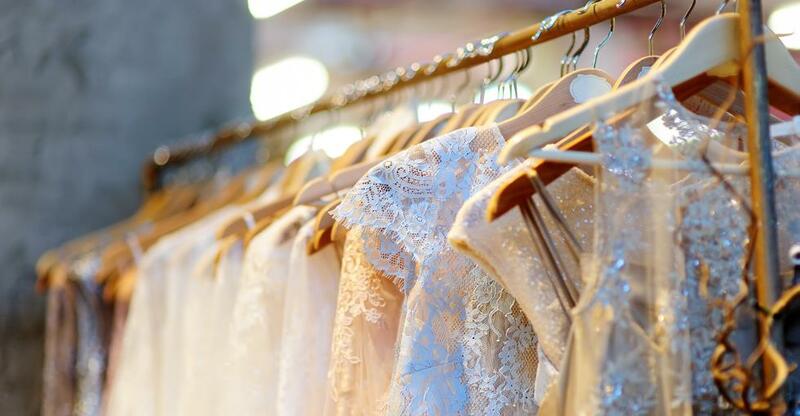 As a bridal shop owner, you will need to be intuitive about what your customers want. You don’t want to get stuck with stock that nobody wants. This industry can be competitive but, if you can manage a balancing act that combines stocking desirable dresses and making the bride feel as if she is the first person in the world to have a wedding, you can have a successful and profitable business. Consider what type of shop you want and what kind of customers will be interested in your wedding dresses before you decide what business to buy.